This year is speeding past – so fast that I’m not quite keeping up! We’ve had several events in our house that require some forethought and planning and each one has caught me by surprise and required some fast planning and tail chasing. Easter has been no different. I have been a little more organised by buying the chocolate eggs early but there are growing numbers of friends and family that can’t/want to cut down on or should just not eat so much chocolate, so I’ve been thinking of alternatives for those gifts. Of course, my immediate thought is crochet. I googled Easter gifts but didn’t really come up with anything suitable (and useful) for adults. I finally settled on dish cloths. I originally went with an Easter themed, knitted cloth (https://lifeofmommab.com/2014/07/28/easter-dishcloth-updated/) but it took awhile and I have a number to make, so I went searching for something else. I found this pattern that I love (http://whiskersandwool.blogspot.com/2012/03/easter-egg-coaster-free-pattern.html) but it’s really for a coaster and didn’t turn out big enough for a dish cloth. I did expand on it and made it in to a square but, once again, it was going to take too long to make enough. So, in the interest of stopping my messing around and actually getting these finished in time, I decided to go back to my old favourite, The Scalloped Dishcloth (https://www.yarnspirations.com/row-en/lily-sugarn-cream-scalloped-crochet-dishcloth–version-1/SCC0512-001758V.html). 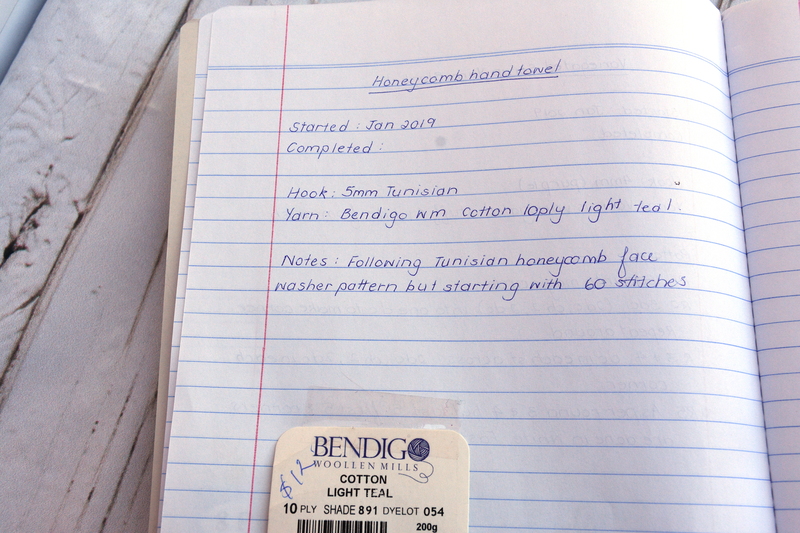 I have made a bunch in Lion brand Kitchen Cotton that I have been stock piling. They’re lovely and bright and cheerful! To make them more “Easter egg” like, I’ve popped them in to some plastic eggs that I picked up at a local discount store. I’m quite happy with the result and am hoping that on Easter morning, the recipients will like them too! Now, I’m off to finish the last one off so I’m all ready for next weekend! As you are probably aware, I like to try new things and keep improving my crochet skills. Brianna K from Brianna K Designs has developed the Infinity Crochet style (https://brianakdesigns.com/infinity-crochet/). I have been watching as this has been posted on line and different projects have been designed and uploaded. When the Aisling Infinity Clutch (https://www.ravelry.com/patterns/library/aisling-infinity-clutch) came up, I knew I had found a project I wanted to make. So earlier this year, I decided it was time. I pulled some Scheepjes stonewash out of my stash and off I went. As for the pattern, that was easy. It was easy to understand and follow, especially considering that I hadn’t tried this style before. 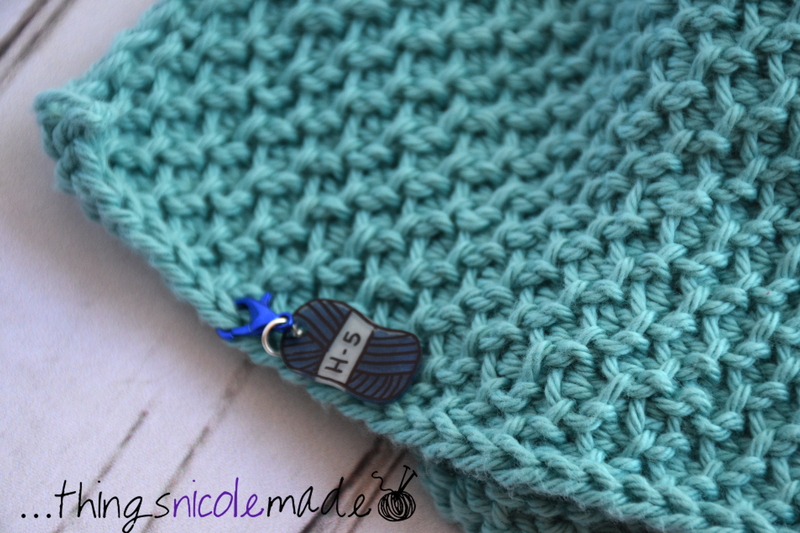 I wasn’t 100 per cent happy with how the “infinity cables” sat – one side seemed to sit evenly and look seamless and the other side was a bit bumpy, but I suspect that that is an issue that practise could fix. Once finished, I blocked the piece to get it into shape. 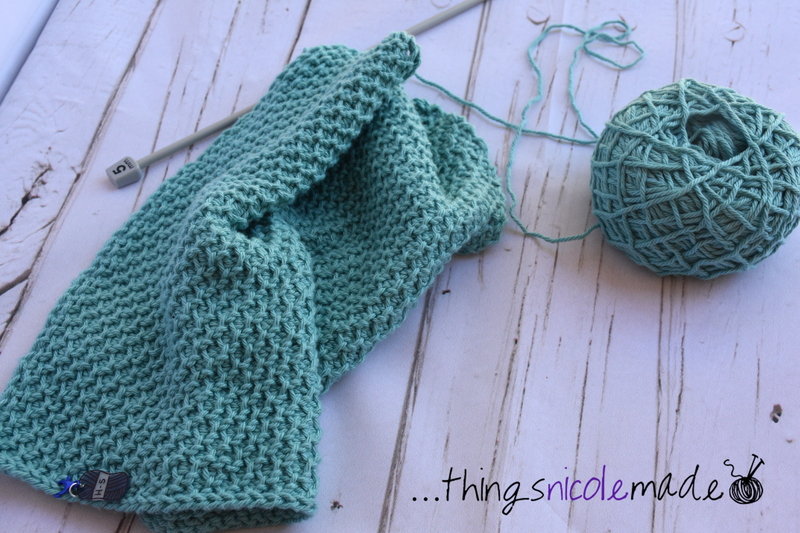 As you can see, the crochet part is quite simple – it’s just a rectangle, with the infinity cable at one end. The pattern doesn’t call for the clutch to be lined, but I felt that it needed a lining to give it strength and just finish it off a bit. My first task was to assemble the supplies I needed to finish the clutch off. These were fabric, tassels, leather pieces and magnetic clasps. I went to Spotlight to get the leather and fabric but went to eBay to get the tassels and clasps. As is usual with eBay, you take the risk of things not being what you expect. The tassels were not what I expected. They were way too small and didn’t come in the colours I was hoping for. When I went to Spotlight, I found some larger grey tassels, so I added them to my collection! My first step was to put one half of the clasp on to the piece. This was covered up in the end by the lining. Next, I pinned the lining in place. I decided to hand stitch the lining on and eventually settled on grey cotton. This obviously showed on the red lining but blended in well on the crochet side. I will admit, this took forever! It was a painstaking process. 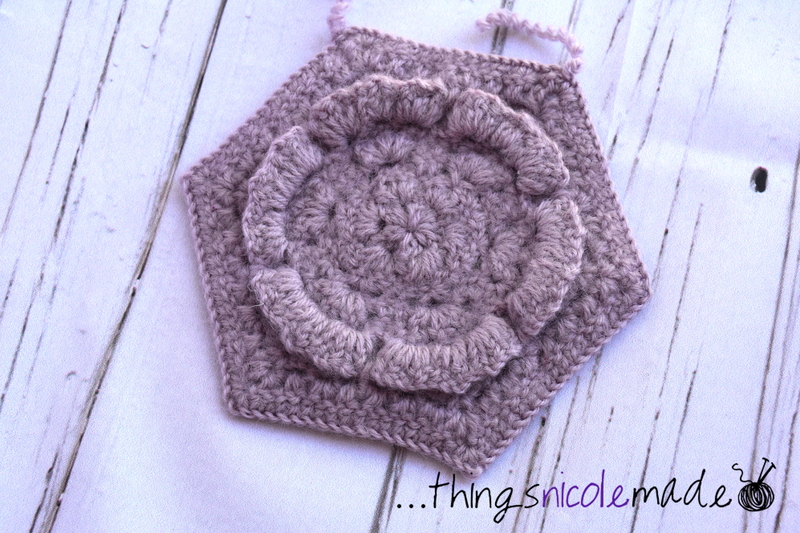 Next time, I think I might try using my sewing machine – I was just a bit nervous as to whether it would give a nice, neat finish or muck it up and I suspect it would be difficult to unpick (my skills lay in crochet, not sewing!). The next part was to sew up the two sides – easy! Next, I added the second half of the clasp and the little leather detail, which hides the fixings on the clasp. Finally, I attached the small tassels to the big ones and sewed them on! It’s done! I have to admit, I love this! 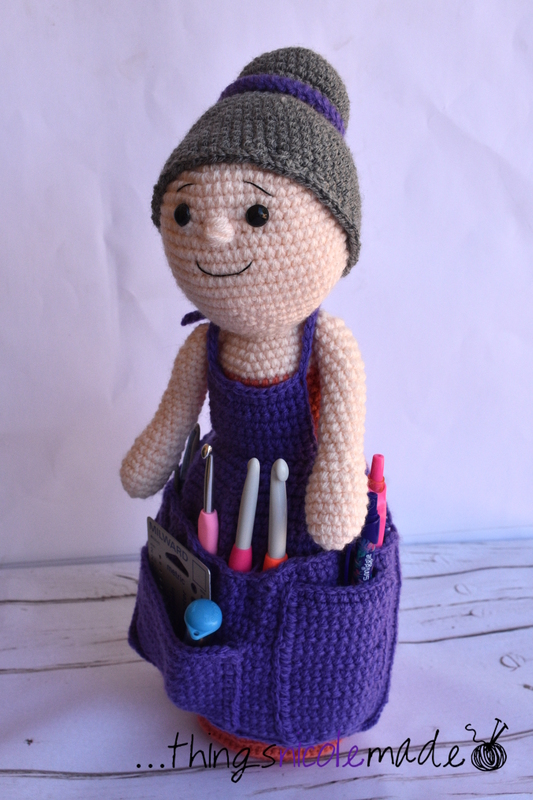 It’s a great size and looks really cool (and I love crochet items that don’t look Nanna-ish!). I would change a few things. I’d perhaps make the lining a bit smaller – it protrudes a little. I’m also not happy with the stitching on the leather detail – I did it by hand and it’s messy on the back, which is still visible on the inside but that’s a challenge to face on my next one! Overall though, it’s a great pattern. 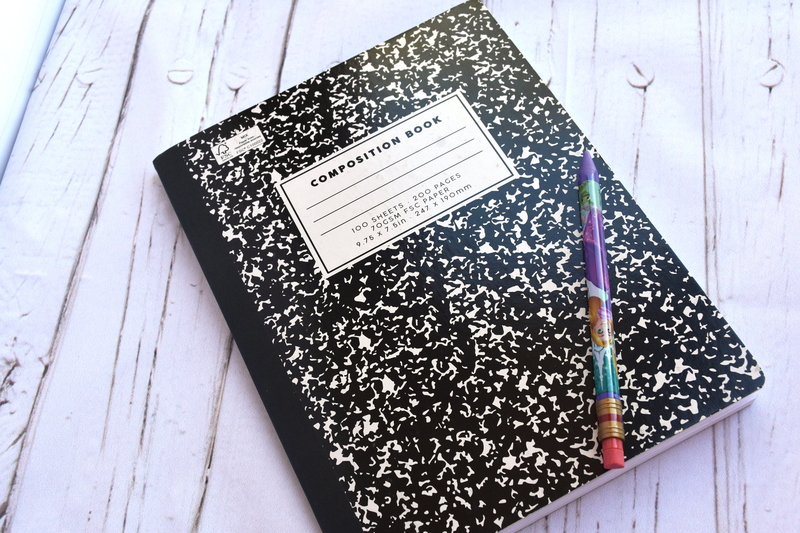 A good size to be quick and easy to make up for those of us with shorter concentration spans! I took this little number out to a party with me last night and LOVED it! It holds a surprising amount – certainly everything that I might need on a night out with 2 kids,such as my phone, bandaids, tissues, pen, lip gloss and more! 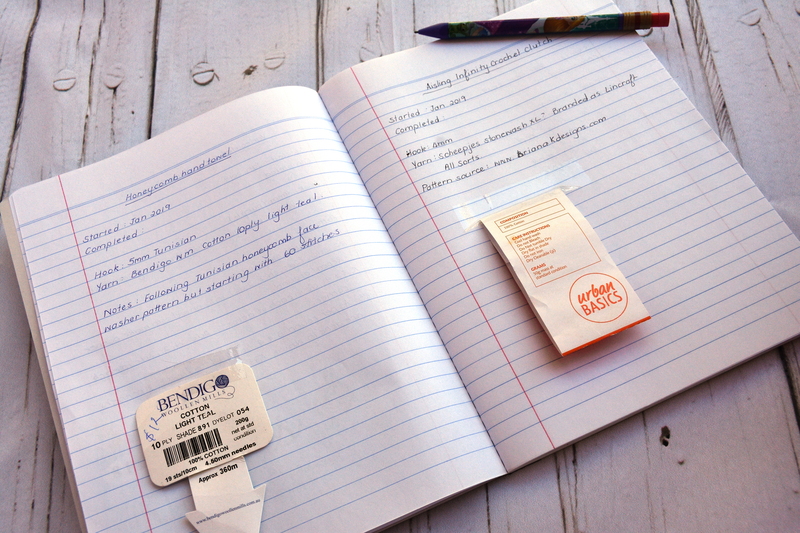 If you aren’t in to writing down what you are working on to keep track of details, here is another way of keeping track of things I have come across that is very handy (by the way, I find myself reaching for my project book often to check what hook I have used on a particular project – it’s awesome!). 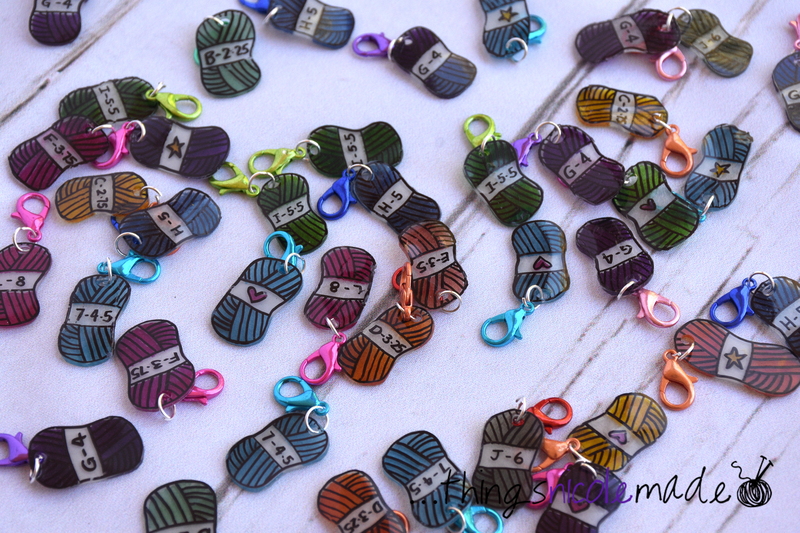 These are little stitch markers. However, they don’t keep a track of what stitch you are on. If you look closely, they are actually marked with a hook size. These can be easily hooked on to a project and voila!, you know easily what sized hook you used for this project. These little markers are super easy to make. I am a craft hoarder, so I had some Shrinky Dink plastic lying around. I simply found a picture of a ball of yarn I liked on the internet, and then, using a sharpie, I traced this ball of yarn onto the plastic. 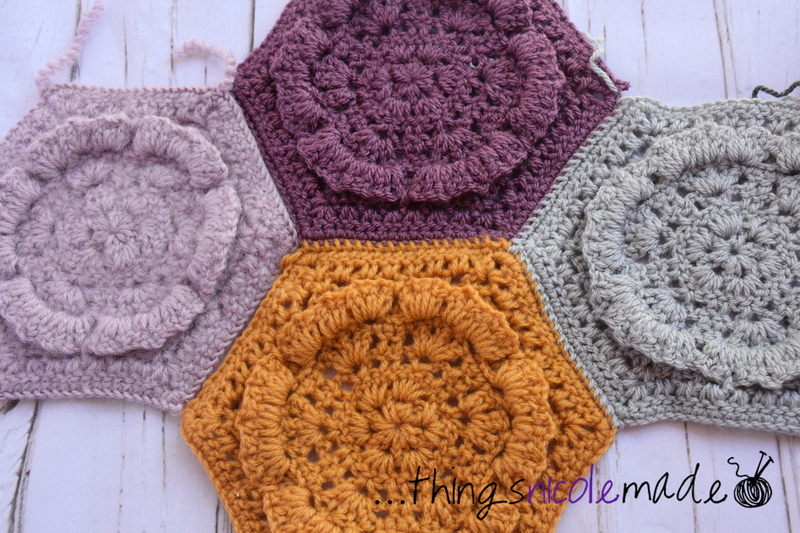 I coloured each one in (trying to match the colours as closely as I could to the colour of the handles on my Clover Amour crochet hooks) and then punched a hole in the top. I cut them out and placed them in the oven as per the instructions on the packaging. The lobster clasps and jump rings I purchased on ebay and, when they arrived, it was just a matter of fitting them all together and they are just about ready to go. I have found through the fitting process that some of the colour does rub off on to my fingers, so I do plan to put a coat of clear nail polish on the back of them just to seal that colour in so it doesn’t rub off on to my projects (which would be a disaster!). 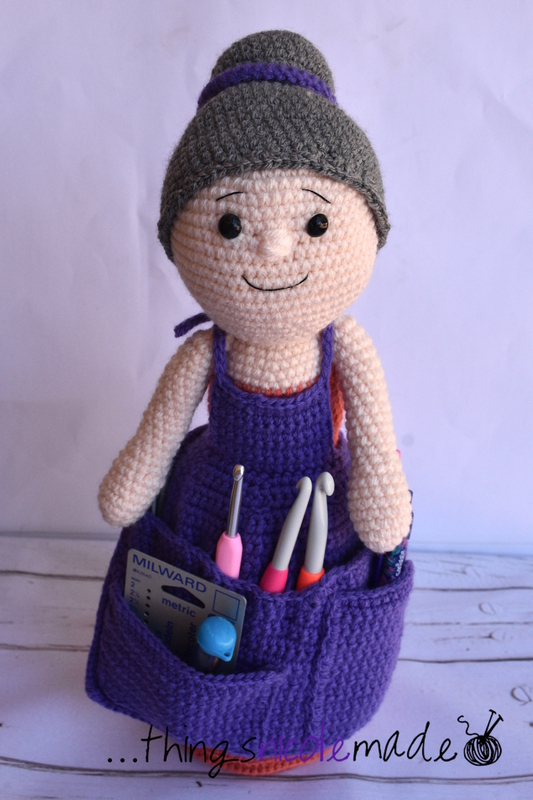 They are a very cute little addition to my collection of crochet tools! 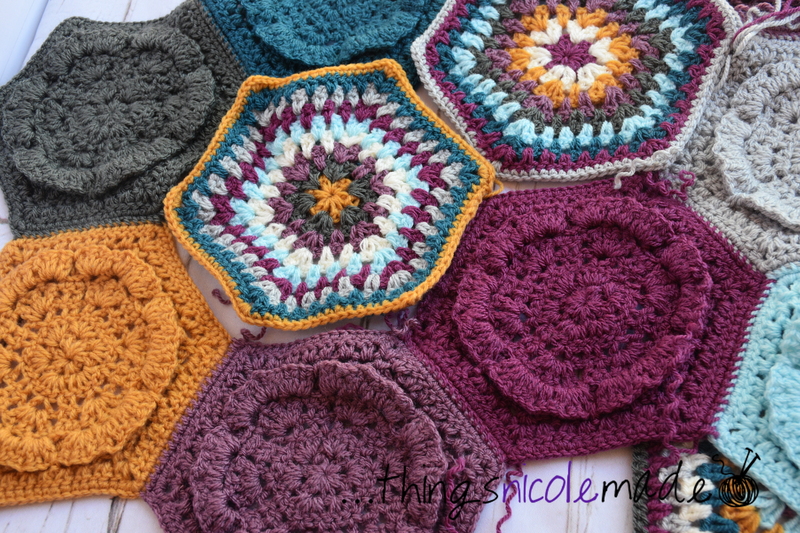 As a person who begins a new project every other week, I have some trouble keeping all of my projects straight. I might work on a project for a few weeks, then put it down. But I can’t leave the hook in the project because I’m sure to take it out and use it on a different project before I pick the first one back up. I’m also not good at keeping the yarn ball wrappers, so if I need more, I can also have difficulty remembering what yarn I am using. Hence, when I finally do go back to the original project, it can be disheartening trying to figure out where I was up to and what hook I was using. I also like to look back on what I have accomplished in a year. The days fly by so fast that I forget I have made something and all my projects begin to blend together! So this year, I decided to try to find a way to conquer that problem. I know a lot of people use ravelry or other computer based trackers to keep a count of their work but I’m not that technologically minded. Also, I don’t crochet near the computer, so I needed something that I could keep at hand and pick up and put down easily. I also love to write – anything, so having a hand written book was important to me. Notes on things I may have changed etc. The ball band for dye lot info etc. So far, it is going well. It’s filling up nicely, and has been useful when I have needed to check something I have done to a project I haven’t worked on in a while! Much as I’m not the world’s most organised person, I do like to feel that I have things organised and under control! 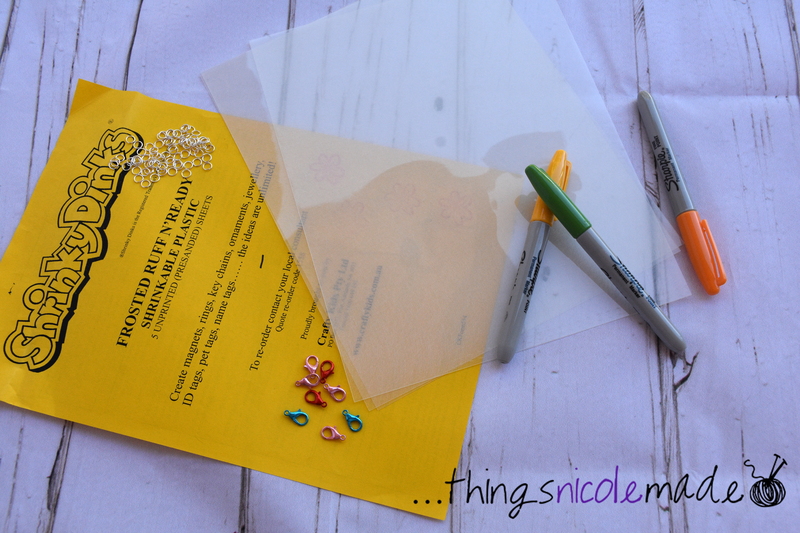 I’d love to hear your ideas for keeping track of your crafting projects too! Aside from crochet, I also like to pass the time cross stitching. And, with a family of four, there is always something or other that needs mending. As a result, I have a lot of needles of varying sizes and for varying purposes. I also drop and lose a lot of needles because I don’t really have an appropriate way of storing them. Thankfully, most of my dropped ones are my yarn needles, and they are large and easy to see and also not sharp if you happen to find one with your foot! 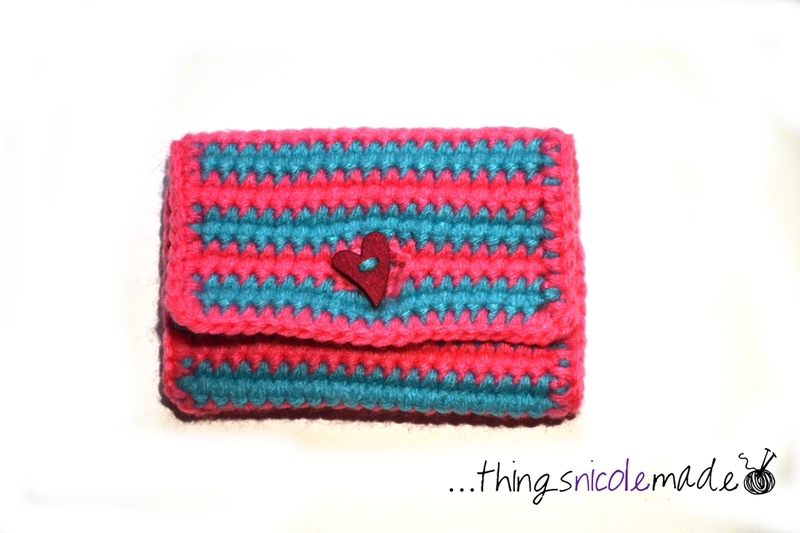 So, I decided to crochet a little needle case. I found this cute little pattern on moogly (https://www.mooglyblog.com/nifty-needle-case/). 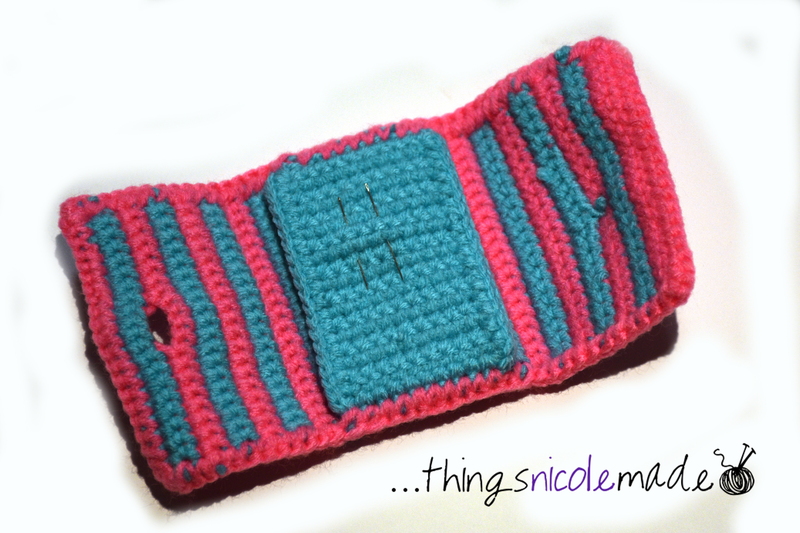 I had also seen a lovely striped needle case, so I decided to adapt the pattern a little to make this one stripey. I used the required #4 weight yarn (10ply to my Australian friends!) and the recommended crochet hook size. As you can see from the photo is has turned out quite big (although these are small needles) and it is quite stiff. I think that in hindsight, I would have made it using #3 weight (8 ply) yarn just to take the scale of it down and also give it a bit more give and movement. 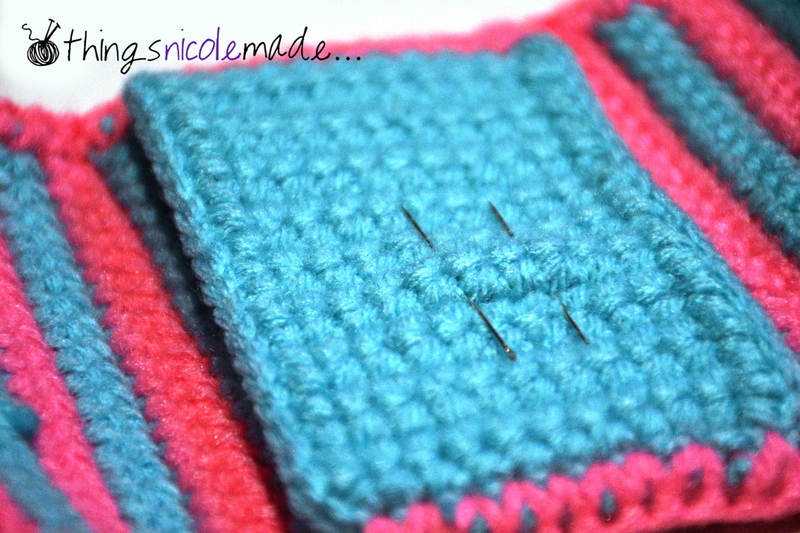 Despite all of that, it is a lovely little needle case and it certainly does what it was intended for – holds needles. And now, my needles have a place to live that keeps them safe, contained and not lost!